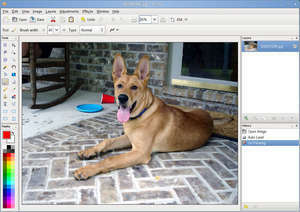 Pinta is a free and open-source image editing application which falls into the category of paint programs and also interesting to note is that the program is based off of the wildly popular Paint.NET application. This image editing is full of useful features including an unlimited amount of history states (which remaining tame while using memory), layers which Photoshop users might find useful and a very wide range of colors through the color palette which allows for a high degree of customization. Like any other modern paint program, Pinta has razor-sharp selection tools which can differential between different color tones which allows you to automatically select different parts of the photograph or project you have open. For security reasons, you should also check out the Pinta download at LO4D.com which includes virus and malware tests. Additional screenshots of this application download may be available, too. Pinta download been highly rated by our users.